Tate Modern’s Paul Klee: Making Visible offers a substantial, chronological survey of the popular German painter’s work. If, like me, you are mostly familiar with Klee’s so-called ‘magic-square’ paintings then this show is full of surprises, brilliantly illustrating the variety and invention of Klee’s overall output. Throughout his life he was always developing, both as a painter-technician and as an inspirational teacher. In so many of the works displayed in this fantastically comprehensive exhibition, their power comes from a deeply considered and thoughtful approach to painting that is both formally experimental and dazzlingly creative. The exhibition’s title is taken from a statement Klee published in 1920, his ‘Creative Confession.’ In it, he says that “Art does not reproduce the visible; rather, it makes the visible.” In his work, Klee was a definite visionary. One of the things this exhibition shows is Klee’s influences working very strongly upon him as he searched for his own artistic vocabulary. He was a friend of Kandinsky, and a fellow member of Blaue Reiter (The Blue Rider), a group of Expressionist painters. In the energetic forms, liveliness and colour of his early work you can see a definite relationship between the two artists. Given that Klee was earning money as a professional musician at the time, and Kandinsky’s well-known engagement with music in his painting, that relationship is even more apparent. 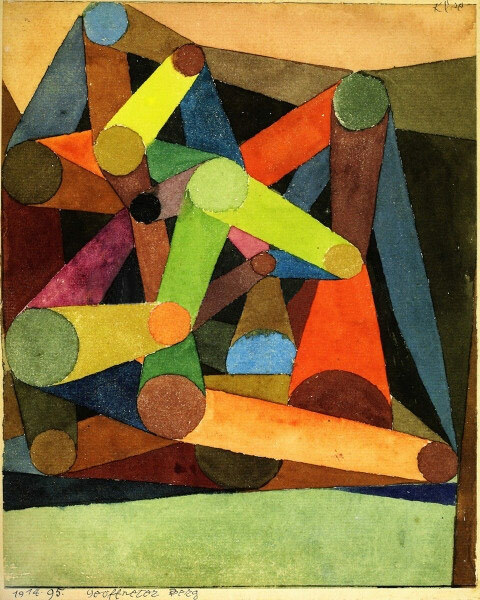 Similarly, you can detect the influence of Robert Delauney in Klee’s experiments with blocks of geometric colour that he was to continue to develop throughout his life and which are, to my mind, his most successful works (though the paintings are surprisingly small-scale – I’d always imagined them large enough to fill your field of vision without having to get up close). 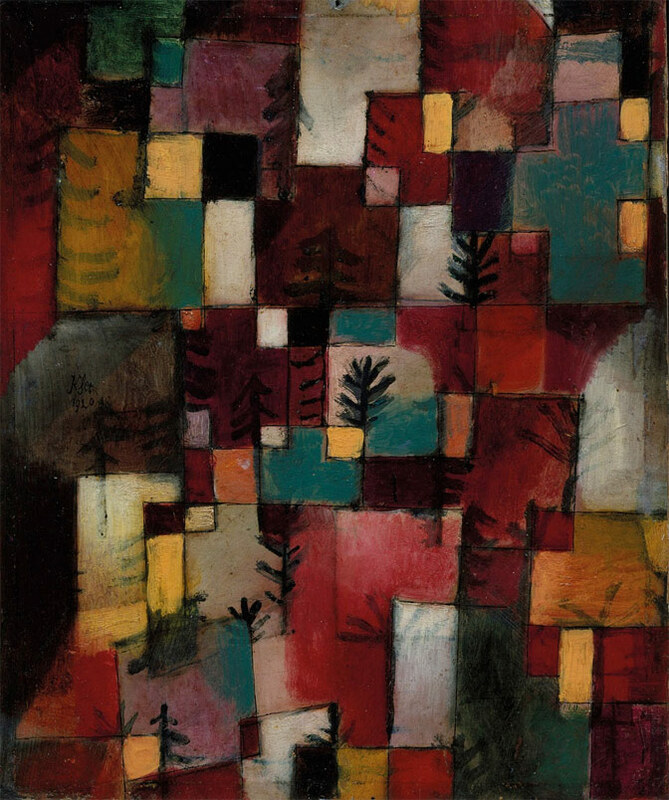 The combining of these colour experiments with elements of landscape, narrative and figuration also indicates Klee engaging with cubism, which he’d seen at exhibitions in Munich and Paris. But not for him the sludgy brown, green and grey palette of Picasso and Braque, rather his paintings shimmer and glow with beautifully rich greens, purples and reds. Colour possesses me. I don’t have to pursue it. It will possess me always, I know. That is the meaning of this happy hour: colour and I are one. I am a painter. The results can be seen in works like Opened Mountain (1914) and Translucencies Orange Blue (1914). Later that year, Europe was plunged into the nightmare of WWI, which Klee survived because of a policy, instigated in 1916, of exempting artists from front line duty. 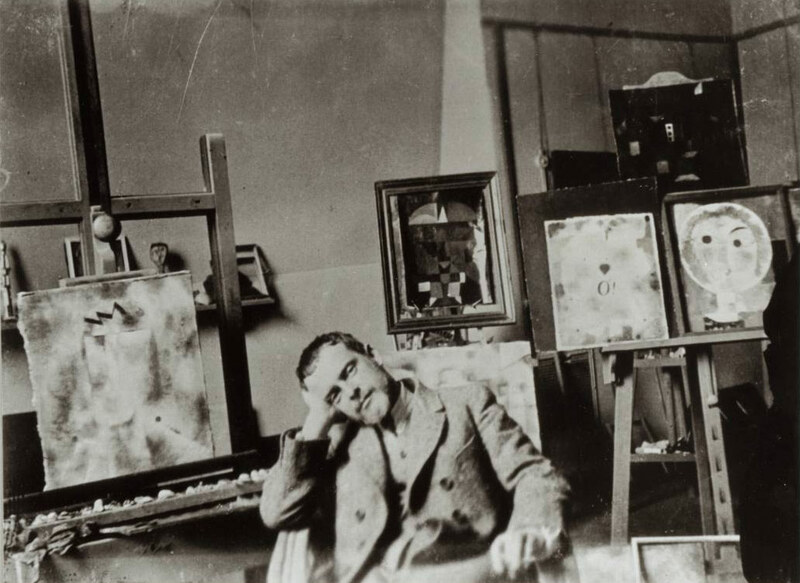 Klee had already lost some of his closest friends and this trauma precipitated further moves towards abstraction: “The more horrible this world, the more abstract our art,” he wrote. The artist of today is more than an improved camera; he is more complex, richer and wider. He is a creature on the earth and a creature within the whole, that is to say, a creature on a star amongst stars. In 1930 Klee was the first living European artist afforded a solo show at MOMA in New York. The Museum’s director had visited his studio a few years before and declared, “Nothing is more astonishing to the student of Klee than his extraordinary variety. Not even Picasso approaches him for inventiveness.” Following Hitler’s rise to power in 1933, Klee was one of those artists singled out by the Nazis as ‘degenerate’ and, after the Bauhaus was closed down and Klee was suspended from his teaching job at Dusseldorf Academy, he and his family fled to Switzerland. Works from this period in his life, such as Fire at Full Moon (1933), Fear (1934), and New Harmony (1936) show Klee’s ability to express the feelings of anxiety caused by the events in Europe, but also to carry on with his wider artistic mission regardless. This was also the case when, in 1935, he was diagnosed with a fatal, degenerative illness. Although his work rate slowed considerably it burns brightly in larger, colourfully illuminated works such as Park Near Lu (1938) and is also filled with despair, as in Catastrophe in a Dream (1940). He finally succumbed to his illness in 1940, aged just 60. 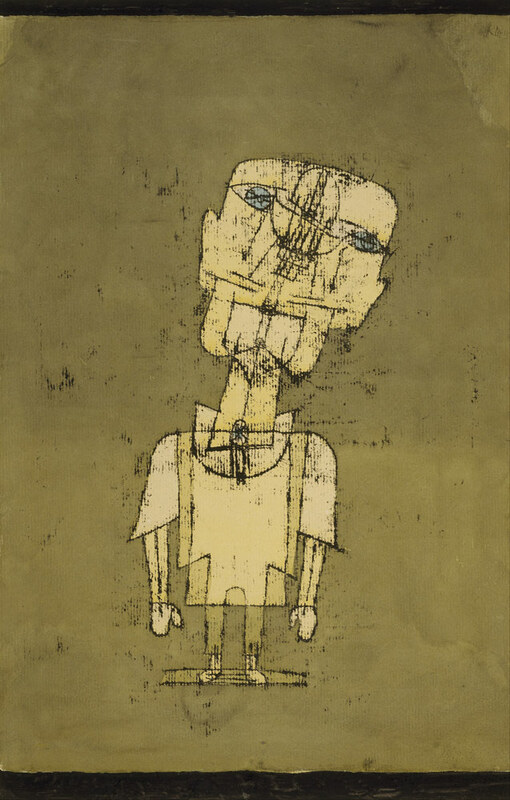 One of my favourite paintings in the show is Ghost of a Genius (1922), thought by some to be a self-portrait of Klee as it has many of his facial characteristics. It was made using a method of transferring oil paint onto paper with a sharp instrument, rather like making a carbon copy. This gives it a smudgy, scratchy quality and, when combined with the puppet-like nature of the figure, the painting both engages and disturbs. His illness, as well as the events taking place in the world around him, made Klee acutely aware of the fragility of life and his own mortality. Perhaps this painting is indicative of how Klee saw himself; as controlling genius of his craft while being at the mercy of life’s trials, a ghost in the machine of art.